The 99 are ordinary teenagers and adults from across the globe, who come into possession of one of the 99 mystical Noor Stones (Ahjar Al Noor, Stones of Light) and find themselves empowered in a specific manner. 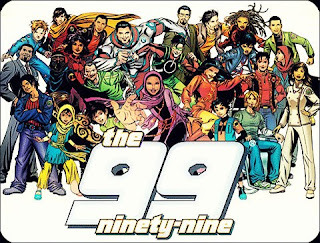 All dilemmas faced by The 99 will be overcome through the combined powers of three or more members. Through this, The 99 series aims to promote values such as cooperation and unity throughout the Islamic world. Although the series is not religious, it aims to communicate Islamic virtues which are, as viewed by Dr. Al-Mutawa, universal in nature. The concept of The 99 is based on the 99 attributes of Allah. Many of these names refer to characteristics that can be possessed by human individuals. For example – generosity, strength, faithfulness, wisdom are all virtues encouraged by a number of faiths. In compliance with Islamic tradition, the Arabic version of the aliases of each of the 99 is written without the definite article "Al-", because use of this precise form is exclusive to Allah. This serves to remind that The 99 are only mortals, and sets them as human role models, with their qualities and weaknesses.